In Letter (19 Jul 1788) to James Madison. Collected in Thomas Jefferson Randolph, Memoirs, Correspondence, and Private Papers of Thomas Jefferson (1829), Vol. 2, 223. No knowledge can be more satisfactory to a man than that of his own frame, its parts, their functions and actions. Letter (7 Oct 1814) to Thomas Cooper. 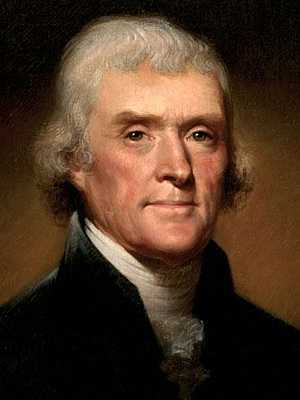 Collected in The Writings of Thomas Jefferson: Correspondence (1854), 390. 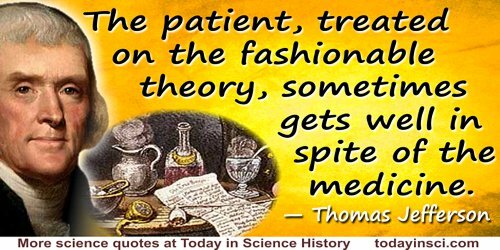 Of all the departments of science no one seems to have been less advanced for the last hundred years than that of meteorology. Letter (5 Sep 1822) to George F. Hopkins. 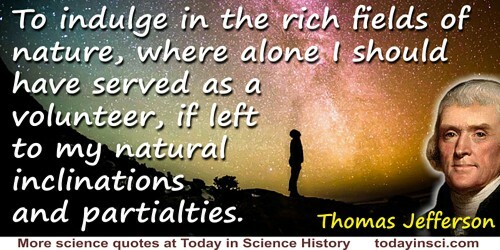 Collected in The Writings of Thomas Jefferson (1854), Vol. 7, 259. In A Bill for Establishing Religious Freedom (State of Virginia, 1779). Jefferson declared he had drafted it in 1777, but it was not until he had just taken office as governor of Virginia that the Bill was presented to the General Assembly of Virginia, by Harvie, on 12 Jun 1779. It was not passed, though a broadside was printed (privately?) and circulated for the consideration of the people. It was eventually passed 16 Dec 1785. In Letter (20 Sep 1787) to Charles Thompson. Collected in Thomas Jefferson Randolph, Memoirs, Correspondence, and Private Papers of Thomas Jefferson (1829), Vol. 2, 223. The new chemistry indeed has given us a new principle of the generation of rain, by proving water to be a composition of different gases, and has aided our theory of meteoric lights. Letter (5 Sep 1822) to George F. Hopkins. 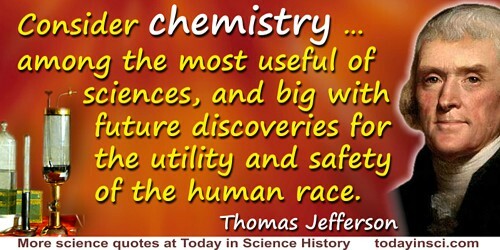 Collected in The Writings of Thomas Jefferson (1854), Vol. 7, 260. The ocean … like the air, is the common birth-right of mankind. Reply (29 Feb 1808) to public address by the Society of Tammany, or Columbian Order, No. 1, of the City of New York, collected in H.A. Washington (ed. 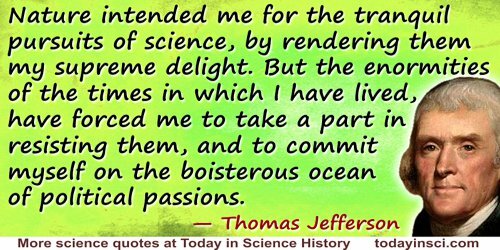 ), The Writings of Thomas Jefferson, Vol. 8 (1854), 127. The plough is to the farmer what the wand is to the sorcerer. Its effect is really like sorcery. Jefferson to Charles Willson Peale, Monticello (17 Apr 1813). Epigraph in Edwin Morris Betts (ed.) 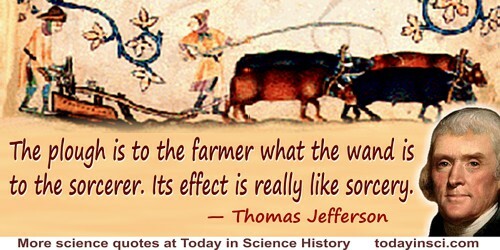 Thomas Jefferson's Farm Book (1953), 47.